We offer 4 days all inclusive fly fishing trips to South Greenland in 2019 with weekly departures from 7th of July to the end of August. approx. 1 hour. Check in at the hotel, dinner and a small meeting with the guide to get oriented and better informed. Arctic Char river and one of the murky glacier rivers that hold big fish, and some sightseeing between rivers. 18:15, but it is good to be there 2 hours early. Arrival at Keflavik airport 22:45.
and back, accommodation, all boat trips, meals, fishing licenses and guiding. Price can be with or without flights! Please contact us for a quote! We offer 7 days all inclusive fly fishing trips to South Greenland. We offer weekly departures from 7th of July 2019 until the end of August. Prices can be with or without flights! Please contact us for a quote. South Greenland Fly Fishing will be offering Fly Fishing and Camping trips to a remote valley for a unique fishing and nature experience. Just getting there is a journey. Arrival in Narsarsuaq 17:30. We come and pick you up at the airport and sail to Narsaq, the boat trip takes approx. 1 hour. Check in at the hotel, dinner and a small meeting with the guide to get oriented and better informed. The next morning we sail of towards the Paradise Valley, it is a 3 hour sail so pick back and enjoy the amazing scenery of South Greenland on the way. We make a stop in Nanortalik, a small fishing village close to the Paradise Valley, to get supplies…..food, drinks and whatever you need to have at hand for the next 4 days. We sail to a farm close to a small village called Tasiusaq, where the farmer greats us and takes us to the lake. There is an hour sail along the lake into the bottom where we will spend the next three nights camping and fishing a beautiful, highly remote place called the Paradise Valley. On departure day we fish until the farmer comes to pick us up, we sail back to Narsarsuaq airport and need to be there before 1600, departure is 18:15. Arrival at Keflavik airport 22:45. Included in our camping trip package is hotel 1 night, boats to get there and back, guide and fishing licenses. In summer 2019 we are going to the Scoresby fjord in East Greenland on an Exploration Fly Fishing Cruise on a Schooner! Come with us on this exciting cruise where we spend 8 days sailing around the large Scoresby fjord, fly fishing and enjoying life in rivers never fly fished before. DEPARTURE 31st of July 2019! Only 10 spots available! We meet in Reykjavik where our charter airplane awaits to take us to Ittoqqortoormiit, East Greenland. After an approx. two-hour flight we land in Constable Point where we will be greeted by our crew who will take us to the Schooner, Donna Wood, which will be our home for the next 7 days. We will start by fishing the amazing rivers of Jameson Land and other areas, there are many rivers and streams that fall to the ocean in that area, but we have our mind set to a few really promising. NASA has several times funded exploration trips to the Jameson Land to research dinosaur and plant fossils found there. We make our way along the North side and visit rivers and amazing places of the area. We will sail into the awesome Øfjord. This is one of the most spectacular parts of the trip. Terrific mountain peaks and granite walls tower 2000 meters up from the sea just like if the Cerro Torre (one of the majestic mountains of the Southern Patagonian Ice Field in South America) and Fitzroy river (in Queensland, Australia) has been moved to the Arctic: A true feast for the eyes. Usually, the sea breeze in the Øfjord during the middle of the day allows sails to be set. A close look at some of the most amazing cliffs and a glacier front. The next days will be spent exploring over to the south side of the Scoresby fjord, we stop and explore the rivers of Milne Land. Sailing the channel between the Bear Islands and Milne Land with a breath-taking view of the spectacular archipelago. As we sail towards the south side of the Scoresby Fjord it is likely that we‘ll be experiencing sights of the largest and the most fascinating icebergs of the journey. This provides a fantastic opportunity for photographs of the majestic and impressive icebergs that are often found in this area. At the south side we fish more glacial waters, where very large arctic char have been caught in nets, we will cast flies at them! We take time to watch the glaciers and admire the calving icebergs falling into the ocean. We will travel deeper into the Scoresby Fjord where we will explore glacial and clear rivers and streams in Denmark Ø, the site of an old Inuit settlement and wintering camp of the first scientific expedition to Scoresby Sound over a hundred years ago. The landscape in there is something unseen elsewhere in the world. As we sail through the unspoiled arctic landscape – or when ashore – we might come across some of Greenland’s sensational wildlife in their natural habitat. Although rare, polar bears, reindeers and narwhales have been spotted as they curiously observe our passing. Other animals are more common, especially snow hares, seals and muskoxen. Regardless of whether hiking in the breath-taking arctic environment or onboard our vessels sailing through the kingdom of ice, the feeling of spotting the exceptional wildlife cannot be described. Although a very rare sight, this is Polar bear country, most times they avoid human contact, but our guides will be armed and ready to make sure they don't come too close, we will also use modern technology and fly drones over the area where we are to make sure everyone is safe. The beautiful two mast oak ship Donna Wood is built in 1918. Representing Danish shipbuilding tradition at its very best Donna Wood was originally built as a lighthouse ship but in 1990 the ship underwent massive restoration and was equipped with rigging and sails. The cabins are cozy and comfortable, two share each cabin. 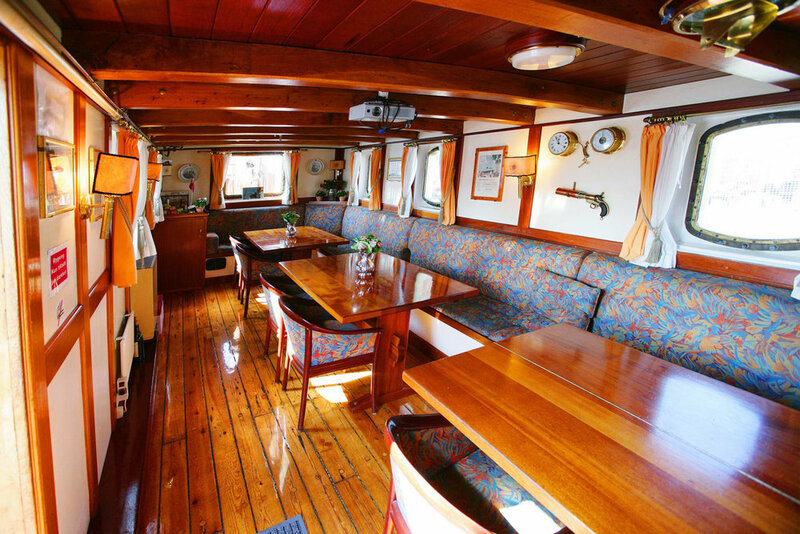 The Deck Saloon has good space and is nicely decorated. International flight Constable Point – Reykjavík. Reykjavik – Constable Point, departure from Reykjavik Domestic Airport 9:15. Estimated Flying time 1 hour 40 min. Constable Point – Reykjavík, departure from Constable Point Airport. Expert in sailing & wildlife of Greenland. Expert Fly Fishermen with years of guiding. 8 days (thus 8 days & 7 nights on board). The Icebergs of East Greenland are among the biggest to be seen!